Posted June 26, 2014, 3:40 p.m.
Latinos in California are killed at twice the rate of whites and are more likely to have been killed by a stranger. That's just one of the findings in a recent report on crime, Latinos and their experiences in the justice system produced by Californians for Safety and Justice. The report, "Latino Voices: The Impacts of Crime and Criminal Justice Policies on Latinos," also found that Latinos are dramatically overrepresented as victims of crime and in courts, jails and prisons. The findings of the report, which was released Tuesday, were reviewed by a panel at the Los Angeles Area Chamber of Commerce. Suro said the report sheds light on the “cumulative disadvantage” that Latinos see at every stage of the criminal justice system. This includes the increased odds of ending up in prison and higher bail amounts. Though Latinos are the largest ethnic group in California, there is very little data on the impact of the criminal justice system, said Lenore Anderson, the executive director of the nonprofit. “When you have a system that is disproportionately impacting the community, you need to talk to the community,” Anderson said of potential solutions. David Guizar, a crime survivor, also spoke on the panel. When Guizar was 10, his brother Fernando Oscar Martinez, then 17, was shot and killed. Guizar’s memory of that night remains vivid. He remembers his mother shouting “No!” over and over. The years to follow would be filled with drug and alcohol abuse. He got sober in 2006. 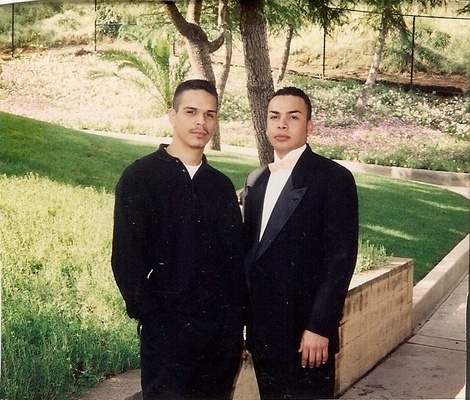 Six years later, his older brother, Gilberto Francis Guzman, was shot and killed in Central Alameda. “It’s not just my family that this happened to,” he said. Latinos are more likely to experience multiple crimes. In a 2013 survey of California crime survivors, 43% of Latinos had experienced three or more crimes in the past five years, compared with 36% of crime survivors overall. The same survey found that Latinos also have a harder time accessing services after a crime. Fewer than half of Latinos were aware of assistance with a victims’ compensation application (34%), help with medical or other crime-related expenses (37%), or mental health counseling (41%). Of those who were aware, one-third found counseling difficult to obtain. Nearly two-thirds of Latinos found the victims’ compensation application difficult. From 1997 to 2009, hate crimes against Latinos increased nationwide. As immigration increases, such crimes increase, according to a National Institute of Justice Report. A 2013 study found that Los Angeles neighborhoods with a larger population of Latino immigrants led to less violent crime. A survey of more than 2,000 Latinos in counties in Chicago, Houston, Los Angeles and Phoenix found that 44% of Latinos would be hesitant to report being a victim of crime because they were afraid that police would inquire about immigration status. The ere are very few stats on "Latino" crime because the mainstream media and the academic community has deemed it racist against Latinos if it is published. Check out the editing policies of the AP. — robert sagun July 17, 2014 at 3:03 p.m.
— Jose Glady July 14, 2014 at 9:12 a.m.
Give me a break! Illegal immigrants invading our country in the millions are now victims of other illegal aliens and its being compared to whites like its their problems???? What these reports show is that its time to start enforcing our immigration laws before we become another failed latin country like the ones the illegal thugs ran from! — DEPORT July 13, 2014 at 9:16 a.m.
Just glad I don't live either in LA or California. Been reading the Homicide Report for a few years and it sounds like a mess there. Of course the liberal politicians are going to hit up the population for more tax money for social programs that they say will dampen crime. They don't believe that moral corruption is the result of what is inside people's actions. — Danish42 June 28, 2014 at 7:43 p.m. This report must be based on criminal on criminal crime not your average hard working Latino/Black in our communities, that report only represents the low-life's, thugs with no jobs the 30 year old gang-banger who has no job 6 kids and lives with mom. When these types of so-called research reports come out, specify exactly who those numbers represent which in most cases are criminals, don't stereotype and brand every Latino or Black in our communities. — Just saying June 27, 2014 at 11:31 p.m.
@Bryan maybe the cops pick on you because you look or dress ghetto, I see the police patrolling my route to and from work everyday and not once have the police stop me, I never give them a reason to, I'm not white either so don't even go there, your demeanor and appearance have a lot to do with how the police react to you as an individual, when people stare down the police it makes them suspicious, when they drive by I pretend I don't see them and everyone goes about their day. — Ghost June 27, 2014 at 7:10 p.m.
La Raza is the source? Looks like they took a report from the NAACP and switched Latino for black. "neighborhoods with a larger population of Latino immigrants led to less violent crime." The LA Times own homicide map says otherwise. What a blatant lie and it is amazing that the editor for the HR would let that go by. Income issues for Latino's? Education issues? Hows that open border stuff panning out? Latino's committing crimes on other Latino's; and the authors of the report want to go easy on that? How come the report says nothing about the 18th St gang? or MS13? After all, those gangs are a frequent contributor to the HR report. This report has lots of cool graphics and nothing else. I sophomore in college could have done a better job. — syscom3 June 27, 2014 at 4:41 p.m. Does this surprise you. It is a direct result of the border not being secured. These guys come here, can't speak english, have no family support to speak of, no education, so who do they wind up associating with, the other people that came here just like them. And what do they do, join a gang so that they can belong. Hence the crime. — David Davis June 27, 2014 at 10:26 a.m.
Facts are facts, period. This independent policy organization is simply stating what they see. I can personally attest to the truth in what is being pointed out, as my family has been a victim twice. I have had guns pointed at my chest and been stopped numerous times by the police (for no reason), to name a few things. I am a UC Berkeley grad who is now a successful professional, so what possible reason do i have to be pulled over when I haven't committed a crime? If these figures were stating facts about non-minorities, i'm sure the reaction would be very different, but it would nonetheless still be a sad fact. — Bryan Garcia June 27, 2014 at 8:58 a.m.
Let's implement a quota system on crime/deaths equal to the representative %age. Please issue this memo to all the gangbangers. — mosche June 27, 2014 at 8:23 a.m.
Not a valid report without the "full" facts. Check FBI statistics...an easy on-line search. The "suspects" in these cases are more Latinos than not, the next category of suspects are African-Americans. Half report...have truths. Tell the "whole" story. Want the truth, check FBI statistics. Caucasians are far more disproportionally the victims of violent crimes by non-Caucasian suspects. This article is not credible, statistically. In other words, it is political in nature, and far from full truth and fact. — Tom June 27, 2014 at 7:46 a.m.
Race. 81% of the victims were black, 9% were Hispanic and only 9% were white. On a per capita basis as compared to whites, blacks were 10 times more likely to be killed. Hispanics were 8 times more likely to be killed. Drugs & Alcohol. At least 61% of the victims were under the influence of one or more intoxicants. Toxicology screens showed cocaine in 39% and alcohol in 35%. The MDs noted that toxicology screens underestimate the number of intoxicated victims. Criminal Records. 67% of the victims had criminal records. Of those with records, 84% had prior drug arrests and 36% firearms arrest. On average they had criminal histories of 6 years with an average of four arrest each. Illegal Drugs. Illegal drugs provided the relationship for 16% of the victims and 18% of the killers. Crime and Gang Relationships. This category includes 17% of victims and 36% of killers. Here, a gang member kills a member of his own gang or someone he knows in another gang. This group also includes contract killings, pimps killing prostitutes, robbery, murders of friends, and so forth. Criminals do not go out to kill strangers. They often kill criminals and others that they know. — The Truth June 27, 2014 at 2:05 a.m. I've seen the reality of what has happened in this city since the breeding war began. You also need to publish the FACT that much of their crime goes UNREPORTED! "the thug" doesn't snitch. right? that is their culture in a nut shell! Read the LA WEEKELY article a few years back about CUDAHY and what happens when they take over a city..
— voice of reality June 27, 2014 at 12:23 a.m. I have to agree with Mike this sounds like a subjective report. — Ghost June 26, 2014 at 8:15 p.m. In the 27 years I have read the Times, I have never seen such an outrageous post warning. — mike conway June 26, 2014 at 4:19 p.m.